A new year means New Year’s Resolutions, and gym companies have long taken advantage of these fitness goals to draw in new customers. For the second year in the row, budget chain Planet Fitness has focused its January ad campaign on it’s non-judgmental offerings and has succeeded, seeing a jump in Ad Awareness across the country. 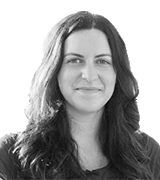 The campaign – “The World Judges, We Don’t” – exists in a heightened-reality universe, where employers openly scorn the dress sense of an applicant and newborn babies comedically slap their fathers. But the underlying message – that no one is rejected when they workout at Planet Fitness – plays up the chain’s “Judgment Free Zone” branding. 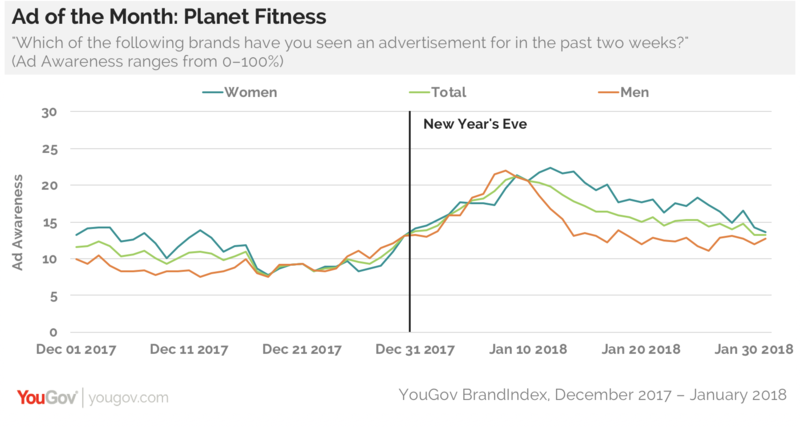 On the whole, Planet Fitness’s Ad Awareness score – which asks if a respondent has seen an ad for this brand in the past two weeks – rose from an average of 11% in December 2017 to an average of 16% in January 2018, an increase of 5 points. This overall gain was slightly higher with women – from 12% to 18% – than men, who’s awareness rose from 10% to 15%. Northeasterners had the highest average, with a score of 21% in January, meaning more than one in 5 had seen an ad for Planet Fitness. The greatest jump was seen in the South, where the average moved from 9% in December to 16% in January.